Home Halloween Halloween Party Anyone? Are you planning a Halloween Party? Need a really cool place setting for your table? 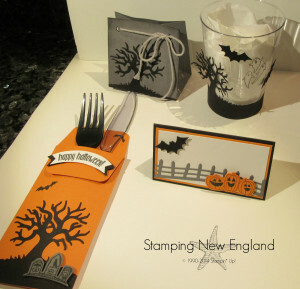 This really neat Halloween place setting was designed by one of my team mates on the Stamping New England Design Team. I absolutely love this design! This design uses the Stampin’ Up! stamp set Spooky Fun and the coordinating edgelits, Halloween Scenes. I absolutely love the Halloween Scenes Edgelits! 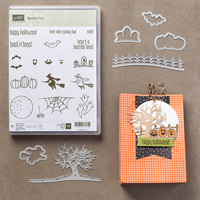 They are perfect for creating spooky embellishments including the tree, bats and the fence using Basic Black Cardstock. Margaret used Pumpkin Pie and Basic Black cardstock to make the Silverware holder. The place card is made with a 5″ x 3 1/2″ piece of basic black cardstock scored and folded at 2 1/2. It is then layered with a 2 3/8″ x 3 3/8″ piece of Pumpkin Pie cardstock and a 2 1/8″ x 3 1/8″ piece of Whisper White cardstock. The pumpkins are stamped on pumpkin pie cardstock using pumpkin pie ink and cutout with the edgelits. The fence is cut from a scrap of Smokey Slate cardstock. The Favor Box is made using the Box Punch Board and a small box cut from Basic Gray Cardstock. It is decorated with the tree die cut from Basic Black cardstock. 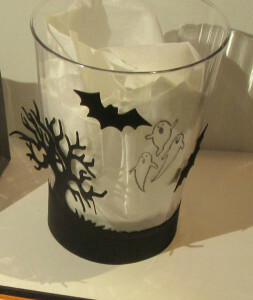 Next use a sponge to add the worn affect to the edges of the box to make it look at little more spooky! And how stinking cute is the cup?? Margaret wrapped a 3/4″ band of Basic Black cardstock along the bottom of the cup. She then added another tree cut and a bat cut from the Basic Black cardstock. She stamped the Ghosts with Black Staz-on ink. NOTE: Staz-on ink can be used to stamp on plastics and glass. So are you planning a Halloween Party? What a great way to decorate!